Tata Motors began its journey as an automotive manufacturer in 1991 with the Tata Sierra. I really can't tell you what it was like because it was way before my career as a journalist began. However I have seen it, I've sat in it, even driven one. It was the first indigenously manufactured automobile, an SUV that was also one of the first made available to Indians. It was probably also one of the first indigenously built passenger cars to be exported abroad. So Tata Motors does have quite a few distinctions to its name. The real turn around for the company however came about in 1998 when Tata Motors built and sold the Indica, the first wholly indigenously developed and built passenger car. The rest as they say is history, the Indica became the mainstay of the company, making its way to a number of households. It has been Tata Motors bestselling car and nothing else in the company portfolio comes even remotely close to it. More than 15 years later the Indica is dying a slow death, sales have tanked in the face of more modern competition. Even the second generation of the Indica called the Vista couldn't change the fact that Tata Motors were lagging behind in several areas. It wasn't just the products that were growing dull, everything from the way the company planned, operated and presented its products and itself to consumers was losing its edge. Not even the associations with Fiat or ownership of JLR could help this. A company that was once the darling of the masses was slowly being ostracised. Tata had lost its mojo! Sometime in 2011 Tata Motors finally realised things were dropping south, rapidly and they just couldn't apply the brakes hard enough to retard that decline. So they did the only thing possible, bring in outside help to set things right in 2012. That help came in the form of Karl Slym, now deceased, who knew that turning things around in the company was not going to be an easy task and would involve a lot of changes. Karl brought along with him a wholly dynamic system of working, out went things that were collecting rust and in came a brand new set of people who understood very clearly what consumers who were more contemporary than the company, in their thoughts and ways, wanted. Karl Slym walks this earth no more but the legacy he left behind during his brief stint with Tata is the Tata Zest, an all-new compact sedan that has been built for the more discerning customer. 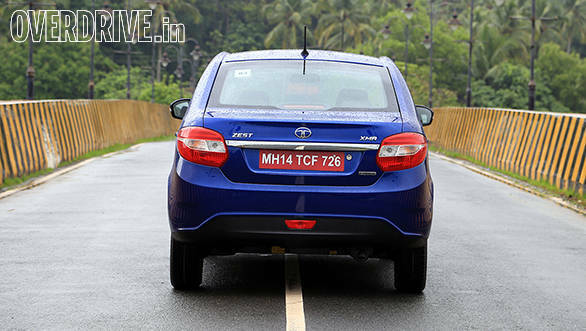 The Zest has been drawn from the ground up, keeping all of Tata Motors' baggage from the past aside. Work on this car began nearly three years ago involving over 6,000 engineers and technicians spread across 11 technical centers in five countries. That might seem like a lot of manpower to develop just one car, but then you have to keep in mind the Zest is not just one car - it is the seed, the progeny of things to come from Tata Motors over the next decade. The other reason for involving so many people in this project is that the Zest is intended to be a global car. The Zest is also not just one car but two, like most modern cars in the compact segment, the platform it has been raised on spawns both a sedan and a hatchback. While the Zest is the sedan, the hatchback is named Bolt and will be introduced in the Indian market in a few months from now. 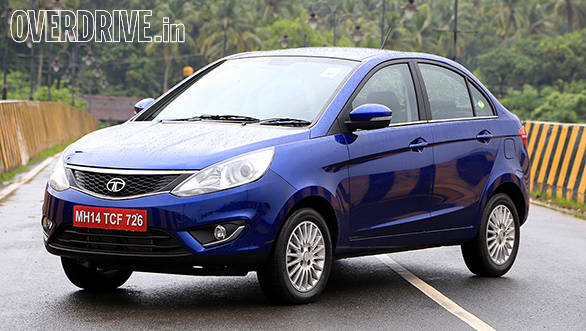 Before the design of the Zest was drawn up, the mandate provided to Pratap Bose who headed the design division in Tata Motors was clear. First the design had to be distinct enough to chart out a map for Tata Motors' future passenger cars. I find that part of the mandate highly commendable since Tata Motors in the past never ever focused on design as strongly as the competition neither did it have a clear idea of what a family of products should look like. Some of you may argue that the Indica was partly designed by the IDEA institute, so the lack of focus should be a non-issue. But that was just the first generation car that came out in 1998, where subsequent models were concerned there is little or no clue what the direction was and who the director was. The later models of the Indica lacked a much needed international appeal and in time the design kept losing its sheen. The design of the Zest, then, is appealing, the finished product that I drove isn't as striking as the car seen at the Auto Expo, nonetheless it still does command a fair share of attention when on the road. The pre-production prototype shown at the Auto Expo in Greater Noida had minute cosmetic additions to accentuate certain characteristics of the car which gave it a more commanding presence. So the red piping along the lower end of the grille, or the exaggerated bumper with its pronounced lower lip and the show car wheels do not exist in the real world. Yet this car looks interesting. The second line is the diamond DLO (daylight opening) which is more of a silhouette than a line. It's the unique shape formed by the edge of the front window meeting the roofline, A-pillar and the door. Now I don't put much weight in that idea but I'll give it this much, it's provided a whole new side profile to the car that is at once contemporary and stylish and does not in the least remind you of the past. The third is the slingshot line that finds itself emerging from above the front fender (is also the shoulder line along the side profile), wrapping its way around the rear of the car and ending in exactly the same place it started on the opposite side of the car. I quite like this line, it's dynamic, has class and lends a premium look to the rear. What I do find a bit odd are the proportions of this car. First off, Tata Motors have built a car within 4 metres in length, 3995mm to be precise. While Honda, Hyundai and even Maruti to some extent have managed to give their sedans of similar dimensions a more proportionate look front to rear, Tata Motors has not figured out this bit entirely yet. So while the front and side profiles do appear evenly matched, the boot of this 3-box sedan looks stubby, almost like it was an afterthought strapped on to a hatchback. Is that a design shortcoming similar to that of the first generation Maruti Dzire? Second and which you might not realise from the images is the thickness of that side profile, from the skirt to the lower edge of the window is a fairly wide area. The shoulder line does camouflage some of that expanse but seen in the flesh, the Zest does look like it's got a bit of a muffin top! I also found the tail lights to be a bit clumpy - they did not gel with the rest of the car, quite unlike the more streamlined headlamps at the front. This maturity in the interior design has more to do with the attention to the smallest of details. Sit in and grab hold of the steering wheel and you immediately feel the lightness and suppleness in the way it's been designed. In the past Tata Motors cars had a very clunky, beefy steering wheel, almost as if to say the chunkier the wheel felt in your hand the more secure the driving experience. The layout and feel of the centre console, the sweep of the dashboard enveloping the instrument binnacle behind the steering wheel, the delicately poised air-con vents flowing with the sweep of that dashboard and small highlights like the mirror finished plastic strip above the glovebox that resembles a luxurious wood finish, all speak of a coming-of-age that's been long awaited. What's even more surprising is the fit and finish of this cabin, the quality standards have improved dramatically. There isn't a single panel gap to be found anywhere inside this cabin and the same goes for the exterior fit and finish. And it's not just the exacting fit but also the quality of materials used. For the first time in over a decade I can with some confidence answer queries to the longevity of this cabin positively. The two tone shades employed in a subtle beige and black also speak highly of a new and classier direction to Tata Motors cars, well done indeed. One component that does lend a fair amount of design aesthetic to this interior is the 2-Din audio system from Harman. 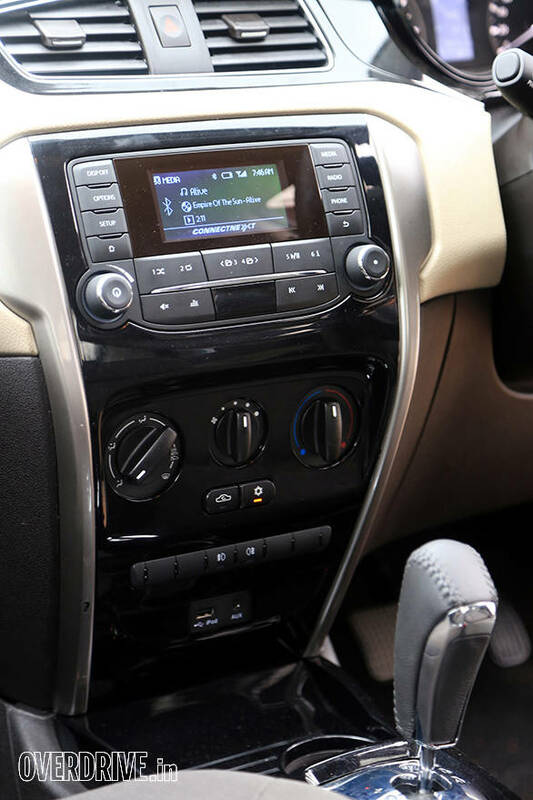 The quality audio makers, often found only in high-end luxury cars, have begun making audio systems for more affordable cars like the Tata Zest. This touch screen is not just well finished, it's got a host of features that will send most of the competition running back to the drawing board. This system not only plays music, but once your phone is hooked through Bluetooth, it will read out your text messages and even control audio and air-con functions through a voice command system. The interface is simple to use though there are some minor glitches. Overall though this is a remarkable unit and one that would also reproduce good sound quality if you employ better speakers. 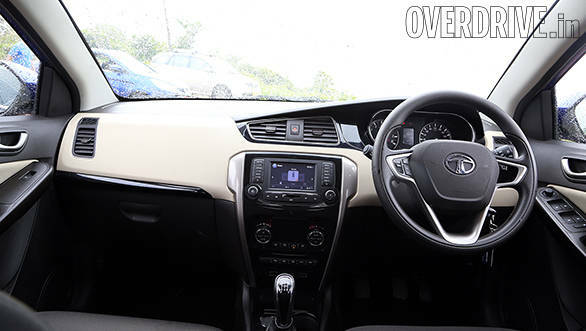 The one advantage the Indica or Indigo and even later on the Manza enjoyed in the consumer's eye was the cabin space. These cabins were designed to be roomy and provide enough leg, shoulder and knee room for every passenger. That aspect hasn't been compromised in the Zest and it continues to provide a very roomy cabin despite not looking very spacious. The dark upholstery and the slightly narrow glass areas make this cabin look smaller than it actually is. Yet the straight roof line ensures there is adequate headroom for the rear seat passengers and the 1,706mm width provides enough room for three passengers on the rear bench. What Tata Motors hasn't done a great job of is the boot. The useable space within is neither as voluminous nor as useable as expected, at least, compared to the Xcent and the Amaze, both of which are benchmarks for this segment. The Tata Zest has 360 litres of boot space while the competition boasts around 10-15 litres more. Then there is the storage areas inside the cabin, I do think these could have been approached a bit more liberally, as in by offering better solutions. There isn't for instance an armrest, neither at the front nor at the back, which could have also doubled up as a storage area for small things. The glovebox is generous but the door pockets are a bit narrow and difficult to access once the doors are closed. There are enough bottle holders, one in every door pocket, but strangely enough, there is just one cup holder right behind the gear shift lever. The Zest comes with a choice of both petrol and diesel engines and that gives the car a versatile customer appeal. The petrol is an all-new turbocharged unit, displacing 1,193cc. Tata Motors likes to claim that this is the first turbocharged engine in the segment, but let me refine that fact, the technology isn't new to India. 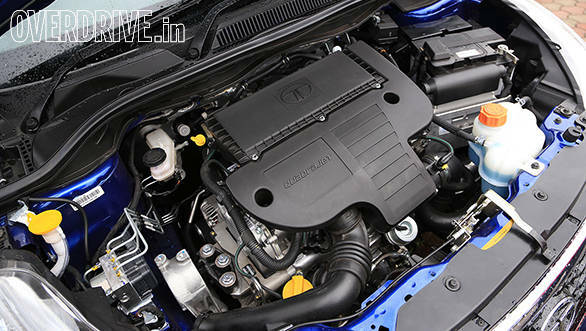 Ford has the 1.0-litre Ecoboost and Volkswagen, the 1.2-litre TSI, both turbocharged fuel injected engines, though to be fair to the Zest, neither of the cars these engines power belong in this segment. So the Revotron has been designed in-house by those 6,000 engineers and technicians I mentioned earlier. The word Revotron comes from blending the words 'revolution' and 'tronel' which is French for balance. Why did Tata Motors go all the way to France to add balance to their engine beats me! But they did find a fair amount of balance and what has resulted is a brilliant piece of engineering. This 1.2-litre petrol is a clean and smooth engine, it's also effortless and finally I can say a Tata Motors engine is fun. On a short drive in and around Cansaulim in Goa, the engine revved cleanly put the car into the power band rapidly and never ever felt short of breath. The turbo kicks in around 1,200rpm and that provides torque pretty early in the rev band. You get 90PS of max power at 5,000rpm and 140Nm of torque between 1,750 and 3,500rpm which is par for the segment. The diesel engine on the other hand may still be the popular choice for India but it's not a new engine. This is the same Quadrajet engine that is sourced from Fiat and tuned by Tata Motors. You get 90PS of max power at 4,000rpm and 200Nm of max torque between 1,750 and 3,000rpm. It's a torquey engine but certainly not as quick as the petrol or for that matter, it does not feel as alive or energetic. 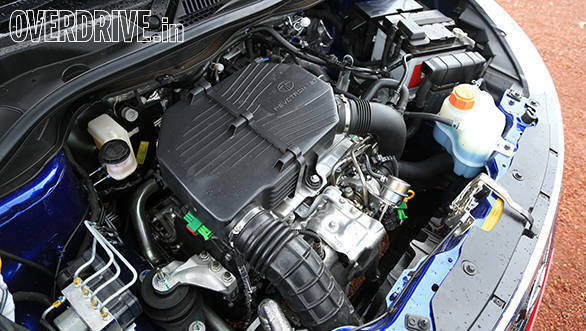 That's not to say this engine is a dud, you can get decent performance out of it, but both the Amaze and the Xcent for instance feel a bit more spirited. The interesting bit about both the petrol and diesel engines is the transmissions used in them. 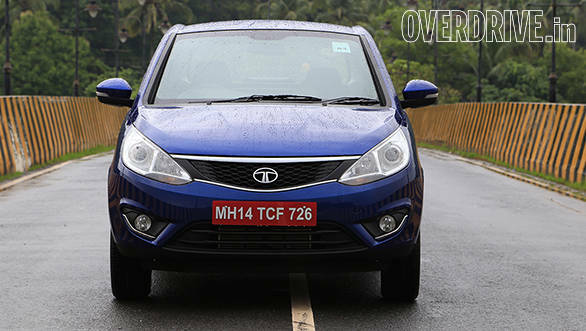 The rumours about Tata Motors going in for the AMT transmission can finally be put to rest. 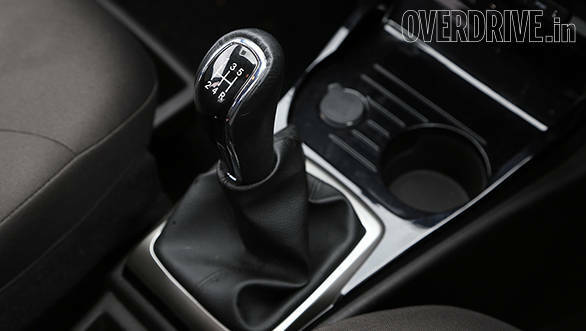 Yes there is an automated manual transmission in the Zest but it is provided only with the diesel. The petrol gets a regular manual transmission but bear in mind even the AMT is a manual transmission that uses the same device as Maruti did in the Celerio to actuate gears. All the AMT does is removes the need for a clutch while using an onboard computer to decide when a gear shift is necessary. The AMT has been sourced from Fiat which means it's a Magnetti Marelli component since they alone supply this technology to Fiat worldwide. The AMT transmission provides both an automatic and a manual shift experience. You get just three driving modes, 'D' to drive forward, 'R' to back it up and 'N' to leave it in neutral. Slip the shift lever to the left and you can then select gears manually by simply sliding the stick up or down to raise or lower the gears. You would have also noticed a small 'S' button just below the shifter and that essentially puts the powertrain in Sport mode. In this condition, the transmission will let the engine rev all the way to redline before it shifts a gear. In normal mode, the management system will select the optimum rev point to shift up or down depending on the engine load conditions to maximise fuel efficiency. In feel, the AMT isn't too bad, driven at a sedate pace in urban areas you will barely notice when the gears shift. However drive onto a smoothly flowing highway and you notice how the automated mode can be a bit sluggish. This can be a bit of a bother if you are driving uphill, since the upshifts can get a bit jerky. If you do sense that, simply slide into manual mode and select the gears yourself to smoothen out things. The diesel is also offered with the regular manual transmission. The same transmission is used with the petrol engine though the ratios are closer than in the diesel to give it that sense of urgency. The manual transmission isn't the slickest transmission around, in fact I do think Tata Motors need to pay a lot more attention to the shift quality on this transmission. On almost every occasion while filming the car, it failed to get into reverse gear at first attempt. 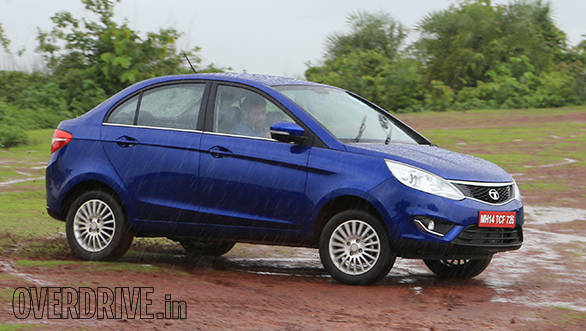 The petrol Zest does not get the AMT transmission instead it gets three driving modes. Eco, City and Sport can be selected by punching in any one of three buttons. What this essentially does is change the throttle responses, slowing it down to get better efficiency or speeding it up when speed is of the essence. To do this, Tata Motors has used a drive-by-wire system in this powertrain which allows the throttle responses to be controlled by the ECU. In either car, the drive-by-wire system works flawlessly and you don't really notice the difference between a cable linked system or an electronic one. 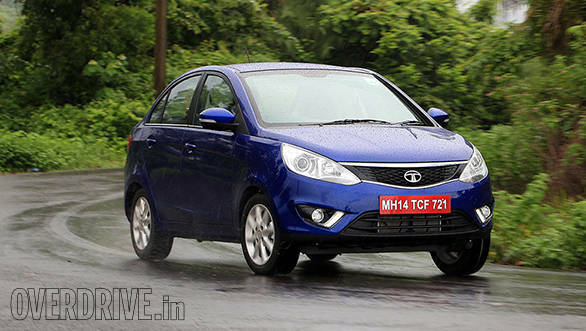 Tata Motors hasn't released fuel efficiency figures yet,. Announcements will be made at the time of launch and while I don't understand the need for that sort of secrecy, what I do know is that we went out and tested it instead. So here are the numbers. 0-100kmph in the petrol Zest comes up in 15.1 seconds while in the diesel it takes 17 seconds, the additional time is thanks to the slightly sluggish AMT transmission. However the petrol isn't too quick either since as soon as you dump the clutch and floor the throttle, there is an onboard traction control system that cuts the fuel to prevent wheelspin and you get a small jerk before the engine fires back up again and starts accelerating. Also, these are wet conditions, so slight slippage is guaranteed leading up to slower times. If the surfaces were dry, I am sure the test time would have improved, though not by a significant margin. Where fuel efficiency is concerned, the turbo petrol returned 21.4kmpl on the highway and 15.1kmpl in city driving conditions which is neither too impressive nor too disappointing. The diesel on the other hand we did not get the time to run fuel efficiencies on a highway cycle but instead got an urban cycle figure of 16.2kmpl. This also isn't too impressive but with the slightly sluggish AMT running in automatic mode, I did expect seeing this figure. Here is the interesting bit about Tata Motors, they finally seem to have realised that weight is a negative characteristic. 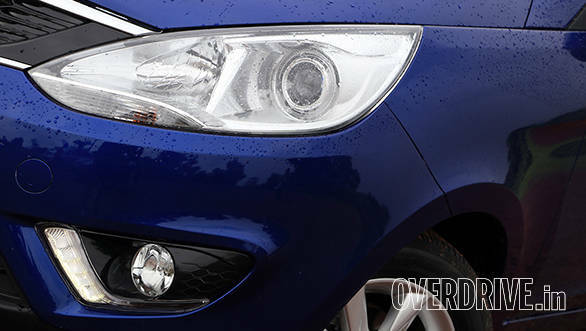 Hence one of the efforts in the Zest has been to keep weight in check, resulting in a kerb weight of just 1,170kg for the diesel and 1,115  1,135kg for the petrol. Now this isn't class leading, that distinction goes to the Etios which is as light as 920kg. Yet Tata Motors seems to have understood the fact that being light helps achieve better performance and efficiency. So the monocoque chassis has been lightened and strengthened to achieve better results and give it a more secure dynamic feel. A zero pivot subframe isolates vibrations while making significant contributions to stability. The suspension is an independent type with a McPherson strut setup complemented by an anti-roll bar at the front. At the rear, the suspension is semi-independent with a twist beam. The suspension is similar to previous generation cars but it has been tweaked and the ride has gotten firmer as a result of using springs and a new dual-path shock absorber that offers stiffer damping rates. Now the ride isn't firm enough like say some of the German cars but it's firmer than ever before. The rigidity in the suspension coupled with an anti-roll bar reduces body roll and the Zest is quite surprising in that aspect. High speed stability is impressive and so are her cornering abilities which she executes almost flawlessly. As I mentioned before, the Zest is the first Tata Motors car that I've had immense fun driving and part of that comes from the knowledge that she is secure, confident and poised to digest almost everything you dish out to her. The 2,470mm wheelbase coupled with the 1,706mm track adds to that stability factor but there are other contributors as well. The electrically assisted power steering developed in association with ZF Lenksysteme who also worked on the Tata Nano is quite impressive, though in the diesel it for some reason felt a bit heavier than in the petrol. There is no feedback but neither is it oversensitive or one-finger-employing light. Pushing this car hard around corners, despite the skies wide open and the road slippery wet, I did not feel her put a step out of place. I am thoroughly impressed with the dynamics of this car which I'd place in the same league as anything else in this segment. The steering is precise enough, body roll isn't uncontrollable and there is no front end dive under braking. All in all, I am quite impressed with the dynamic aspect of this car, especially the petrol which feels just that bit more confident than the diesel. In a segment where power and torque values are nearly the same, the sole differentiator often comes down to styling, practicality, space and features. 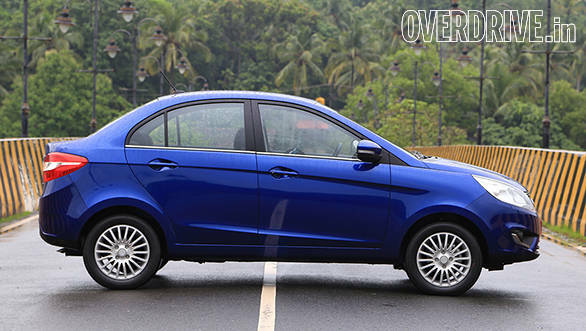 On the styling front Tata Motors has got its issues sorted out for the Zest. It's got a practical cabin though we'd like to see a bit more value coming from there. The space is also impressive, generous cabin that could be the best in class but a boot that could also have been a little larger. That brings us to the features then, a critical aspect that most customers look at very closely because this, for some strange reason, spells value. 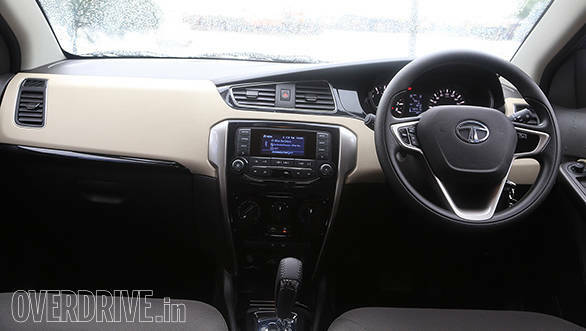 As I mentioned earlier, inside the cabin there is a lot of equipment but unique to the Zest is the infotainment system developed by Harman. Now Harman have collaborated with Tata Motors prior to this for the Aria project and even in the Safari, they have done some good work. This time around the intention was to provide an audio experience complementing the car. So what you get is two systems, one basic which gives you all audio formats and connectivity options. The other is a more state of the art system with a touchscreen that among other things, also reads back your incoming text messages once you've connected to the system through Bluetooth. It also allows the system to be controlled through voice commands, so you don't have to lift a finger to change tracks or stations, simply press a button on the steering wheel and talk to the audio system. The system is also hooked up to the air-con system allowing you to control temperature and blower speeds using your voice. Big question though is audio quality and that definitely leaves something to be desired. The only way to get around this is to get better speakers. The audio system itself is a fairly inexpensive unit developed by Harman for markets like India, Russia and Brazil so don't expect impressive audio quality. So is the Tata Zest a better car than the rest of the cars in this segment. I don't think so, but for the first time I am willing to consider the Zest in the same segment and to evaluate it on the same stage as the Xcent, the Amaze or the Dzire, all superstar compact sedans. What Tata Motors has done is simply brilliant, they haven't made a great car but the Zest is a highly competent car that can finally match up to anything else in the segment. I can appreciate the fact that for the first time in years there is a sense of direction and a remarkable focus to achieve the goals set at the end of that road map. I also appreciate the fact that for once Tata Motors isn't trying to reinvent the box as much as they are trying to clean up the box of all its past junk. The big challenge however for Tata Motors after the slump of the past two years and the erosion of its equity will be to convince consumers to bite into this car. Not many want a Tata product but I think that is set to change. One issue that I do hope has also been addressed is that of the reliability and quality. But having seen the kind of product it has come out with, I am now perfectly willing to believe Tata Motors when it says that that area has been taken care of as well. I think it's time you considered walking into a Tata Motors showroom and give the Zest an opportunity to present its case. The result I think will surprise you just as it surprised me!